How do you catch a snake? A GBH knows! 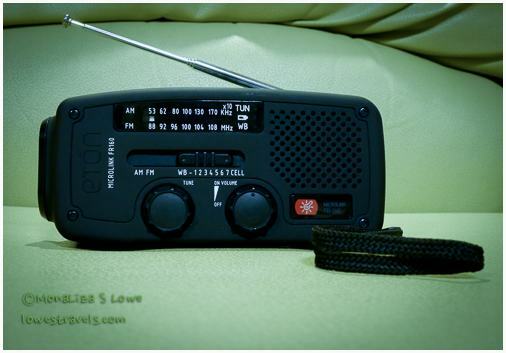 Have the necessary tools to be aware of and track storms. We use the Weatherbug and MyRadar Pro apps that send alerts, and we have a handy solar/hand-crank NOAA Weather Radio (thanks, Ben!) that will function even while we’re boondocking. Our cell phones are also programmed to send us severe weather alerts. Stay tuned to the Weather Channel and monitor the prediction and progress of storms, whenever possible. Always know which county we are camping in, since warnings are usually issued by county, not city. Have some emergency clothing and other items ready by the door, in case we need to get out in a hurry. 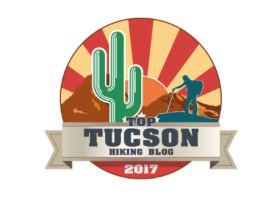 Learn where any shelters or sturdy structures are around the campground. Although we realize we can’t outrun a tornado, we hope this short list will help keep us on the go with a minimal chance of major weather problems. Any other tips you more experienced travelers can add to our list? Well, that little rant was totally off-topic, but I had to digress and share our recent learning experience. With that out of the way, here is the real story behind the title – it’s about a snake and a big bird, a Great Blue Heron (GBH for short). 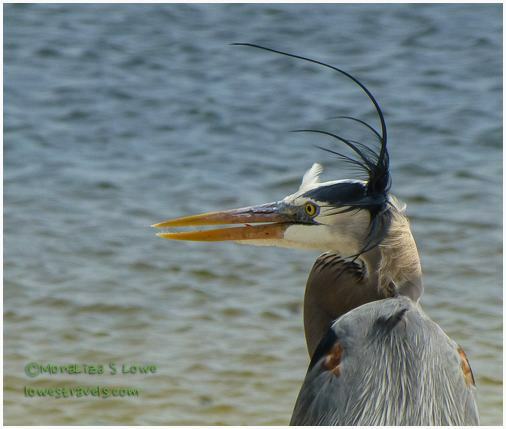 This is a leftover story from our stay at Gulf State Park, where the Great Blue Heron was a familiar sight. They usually stood at attention around the campground, by the lake, in the woods, on the beach or even on top of a tree, posing for me. Always focused and waiting for unwary prey, they are really fun to watch! The tall, long-legged Great Blue Heron is easily spotted, and many of you have probably seen them since they’re very large birds with one of the widest wingspans in North America. But I doubt that most of you have taken as many pictures of them as I have! 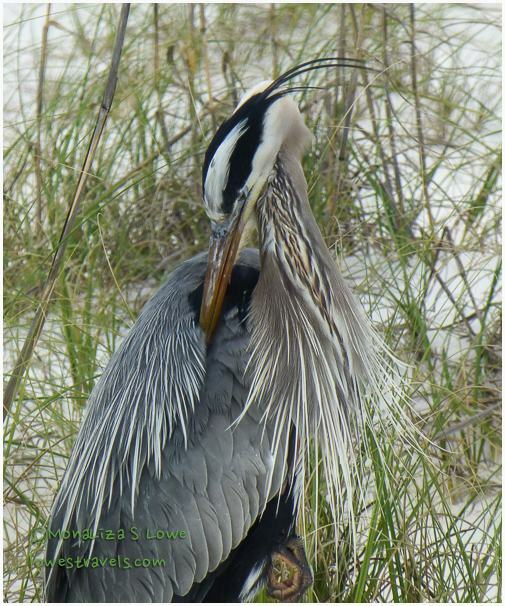 We spent a lot of quality “heron-watching” time while at Gulf Shores, even witnessing one of them stalking and catching a snake. I thought it might be worth sharing some of those moments. 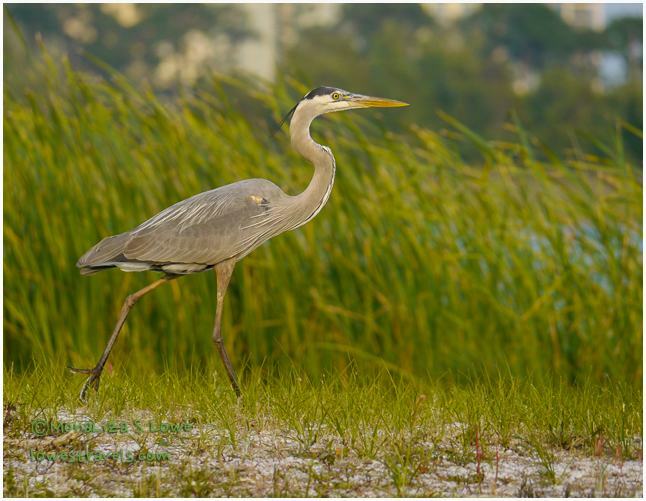 Lets have fun with a few heron facts – Great Blue Herons are identified by their red-brown thighs and a pair of red-brown and white stripes running up their flanks. The neck of these herons is rusty-gray in color, with black and white streaks running down the front. They have a mostly white face, with the rest of the head being more pale. This is who I am – tall, pretty and proud of it! Great Blue Herons look huge in flight, with a wingspan of up to six feet. In flight, a Great Blue Heron’s neck is folded back into an “S” shape, and the legs are stretched out behind its body. A Great Blue Heron is capable of swallowing a fish many times wider than its narrow neck, which has been known to choke and kill them on occasion. No, no, no! 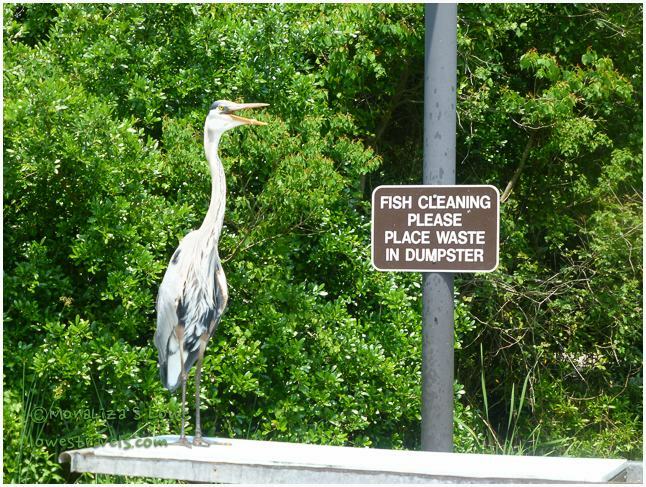 Don’t put fish parts in the dumpster – that’s my lunch we’re talking about here! Although they typically nest in colonies, herons hunt alone and that’s why I’ve never seen a group of herons hunting. Besides fish, they eat a wide variety of prey such as frogs, salamanders, turtles, snakes, insects, rodents and small birds. Just look at that menacing beak! Hey, don’t get too close or I’ll put your eye out! They have special vertebrae in their necks that allow them to curl it into an “S” shape. This allows them to make a long and lightning-fast strike at their prey. On one of those days before the storm hit, Steve and I were reading and relaxing outside when we caught a glimpse of a GBH stalking around. Of course, I ran for my trusty camera while Steve grabbed the binoculars to enjoy the show. We watched as it stood completely motionless for a long time, then walked very slowly – almost like a cat – getting into striking range of its prey. Then, with a quick thrust of its sharp bill, it snapped up a snake and tore it in half. 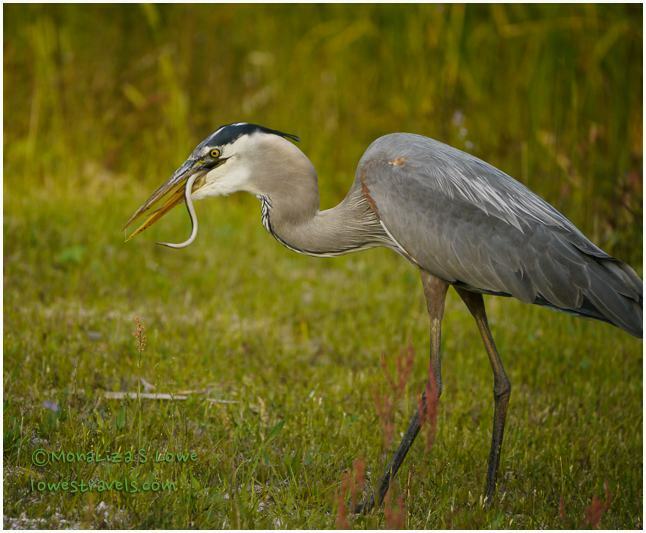 That poor snake must have wondered what the heck had just happened, as it continued to wiggle around in the heron’s mouth. 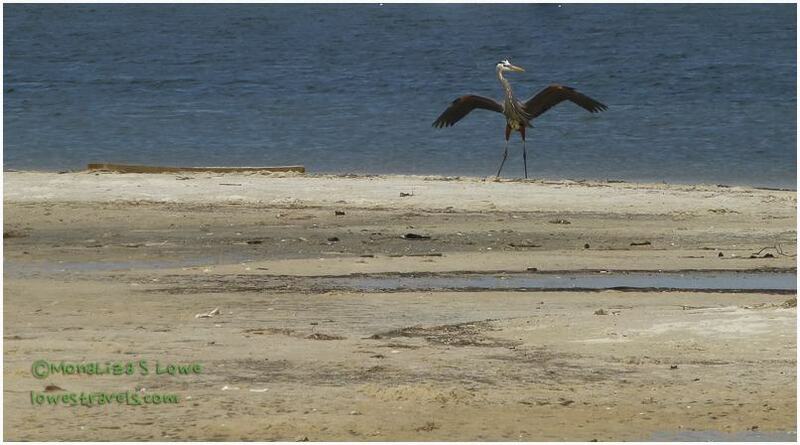 The following short clip shows that the snake almost got away, but the heron was quicker. And to think I was right in that area a little earlier taking some pictures! I called that heron our “guard bird” for getting the snake before it could come into our site. Do I detect a smile on this guy’s face as he enjoys his lunch? Wildlife scenes such as this may not be spectacular, but to us they’re fascinating and make our lifestyle even more rewarding. More so when it happens right outside our door, like when the Sandhill Cranes visited us in Sebring, Florida, or when the little Black Bear emptied out our bird feeder in Lake Monroe, Florida. Good times! 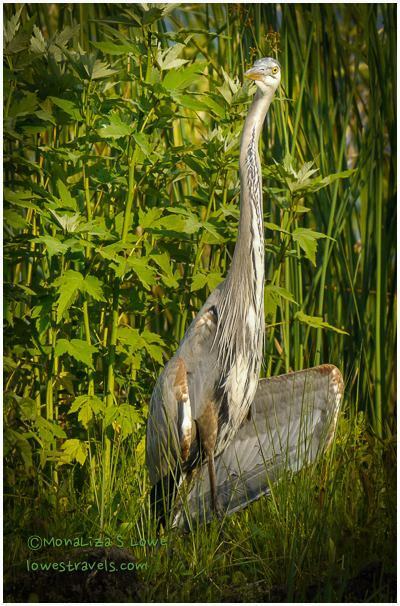 We love Great Blue Heron, they are magnificent birds. Can’t believe you captured the snake hunt, very cool! WOW!!!! EXCELLENT!! And yes… he was smiling because of his lunch AND FOR YOU! He knew he was being photographed! Such a neat video! I do have seen herons plenty of times. But I never get to snap pictures of them as remarkable as yours – sharp, crisp, full, detailed, and well-composed. As for the weather, uhm…. have you tried … rain dance? 😀 😆 Safe and happy travels, Betsy. Thank you Rommel, I think my camera helps taking those crisp photos. Outstanding post and brilliant photo captures! All I can say is thanks, and wow! 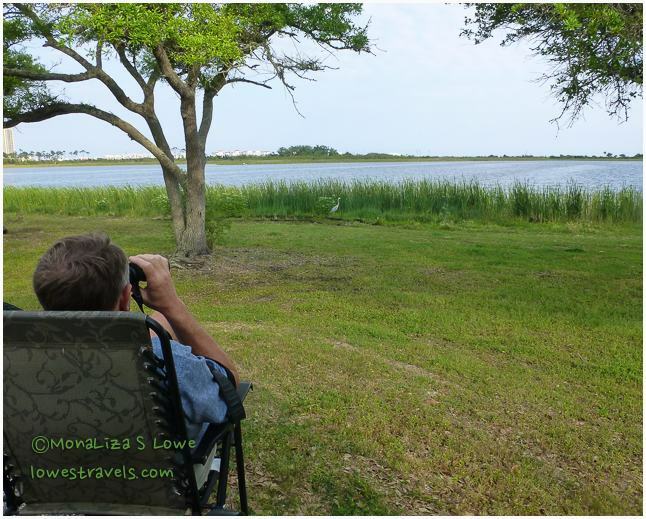 Great post … the GBH is a study in patience. I’ve seen them hunting, but first time catching a snake. Thanks for sharing. Thanks Erin, Yup agree, GBH has tons of patience, lucky for us he was right there and we had a front seat row of the action. Great post! Loved the video and pictures of the GBH. Also was interested in the weather issues, as a fellow Californian who will find himself in more active weather areas in the future. Thanks, this short list will hopefully carry us through until we are out of the tornado alley. Thanks Bulldog, glad that GBH visited us. You are spot on when you say the wildlife scenes are fascinating! 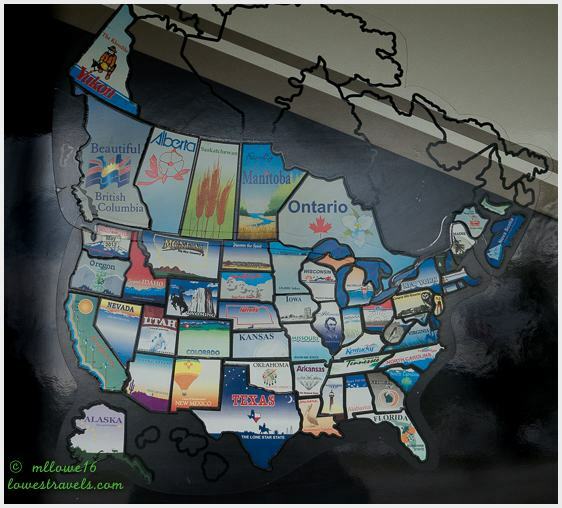 It’s a huge reason we travel too! Great post as always MonaLiza! Thanks Gay, and yes our lifestyle afforded us with these simple pleasures. Oh my goodness. Thanks for all those awesome photos. I love seeing all the different sides of the blue heron. I think the first photo is my favorite. I don’t know, I might be able to match you on number of pictures but I don’t think mine are as good as these. I seem to attract them. Whenever I go to the beach, there they are too walking right toward me. Wow is that a great campsite for armchair wildlife viewing. Ha ha Sherry, Im glad to know that I am not the only one who takes tons of pictures. I too am a huge fan of the Great Blue Heron. I’ve taken many, many pictures of them but none to equal your beautiful pictures posted here. I loved the video! What a treat to not only watch him catch the snake but to catch it on video, too! Thanks for posting. What fabulous photos of the GBH. I’m with you, I never tire of watching this beautiful bird. As for the weather, it sounds like you have set up all the precautions you can, besides not being in the midwest during tornado season, as some have mentioned. As weather patterns are changing, it seems the seasons for unusual storms are sadly lengthening. We have had storms/tornados/earthquakes to watch out for in OK, IL, IN, and OH. Thank you LuAnn. I was glad that GBH came to our site for usually that guy is just standing motionless when I see it on our walks. Unlike last year we are now proactive and always on the lookout with weather, especially that there seems to be no normal weather now. That is so true MonaLiza. We are apt to see unusual weather wherever we travel these days. Eewww – I wonder if the snake is still wriggling down there in its tummy. I think it still was for 5 mins. Ha ha Just hiked the Noccalula falls today. In addition to your emergency bag we learned the hard way to keep 10 pills of each kind (even aspirin…) close to the quick grab bag. I use My Weather and Weather Underground and have found that both are crowd sourced and WU shows better at my GPS location. WU displays the same weather alerts to my phone but I get them 30-60 min before My Weather (and the alerts for both come from the same place). WU will show tornado or severe storm track boxes on their map with my GPS location. They both have strengths and weakness so I use both with bad weather in the area. Thank you for that additional tip, so far i like Weatherbug. I will check WU. Thanks Cheryl, the list is only as good as when it really happens. 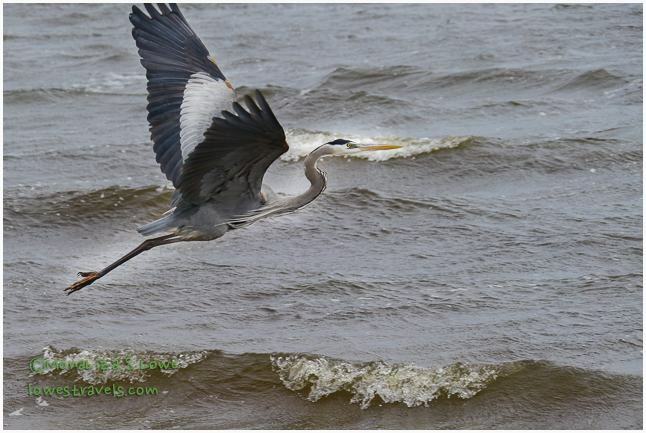 WoW cool Great Blue Heron video and photos! I’m glad you survived the storm. Incredible how much rain and wind you had to experience. Good luck with your storm tracker plan. Thank You Marcy, we are also watching your weather out there, I think you should have this rain. MonaLiza, Spectacular photos. Gotta love those “nature moments.” Did that snake’s tail ever stop moving? I loved your Great Blue tutorial MonaLisa-we’ve all seen them everywhere but you took the time to show them to us close up. And the snake video!!!! You’re absolutely right, these are the small pleasures that make life interesting. I think you’ve covered the “weather watch” tools completely and I, too, think that they are very very important to monitor often. We had a few close calls in northern Florida and in Memphis. Once you do, you realize how important it is to always “keep an eye to the sky”. Thanks for taking us along and happy trails! Agree, keeping an eye to the sky is now our top priority as we start climbing up north. You are welcome Sue, i know we have seen many of those GBH shots, and finally got one that is worth sharing. Fabulous heron shots! Don’t have much to add to your excellent weather planning kit. The only other thing we do is try to stay out of well-known bad weather patterns. So, for example we don’t travel the Midwest during tornado season, stay out of FL during hurricane season etc. it doesn’t always work perfectly, but we try to travel with good weather as much as we can. Thanks Nina, you know this year could be one of those “new normal” season just like that Polar Vortex last winter. Unlike last year, the planning kit is now a must on our new route and hope for the best. Super shots of the GBH. I love the one in flight. How neat that you got to watch the GBH struggle with that poor snake. We watched this happen in Shark Valley but the bird didn’t snap the snake in half. As a result the snake kept wrapping itself around the beak and the bird really had a fight but eventually the bird won. Thanks for adding the video. Thanks Pam, its one of those lazy days that we got lucky with the GBH, and we love those moments. Great video ML even if it did put me off my breakfast! Did he ever get the snake to go down? I am a big fan of the GBH as well! The GBH tore the snake in half and got it in for a long time. Wow, what fantastic GBH photos! Even though we see them almost everywhere we go, the GBH is one of our favorite birds. Haha, love that you had your own “guard bird” — and I agree, watching the birds in your own “backyard,” wherever that might be, is so rewarding. (BTW, thanks for the list of tips for traveling in tornado territory.) Safe travels and no more storms for you two! Thanks Laurel, those instantaneous moments are priceless. And oh, after the storm an alligator was patrolling near Betsy too. The day after the storm, we did ask ourselves, “what mess have we gotten into?” Thanks Ingrid, the GBH is fascinating to watch especially when they are stalking. That snake catch is fantastic! Excellent photos of this beautiful bird! Thanks for sharing!